5-Piece Easy Layers Pan Set. One cake mix or a single batch of batter is enough to fill all five pans, and most ovens have the space to accommodate all five pans baking at once. Now, the choice is yours. 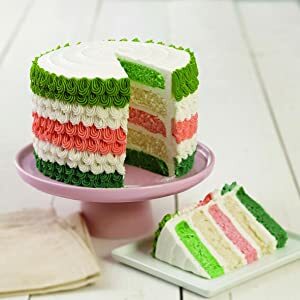 Make an ombre cake, tinting the batter in five gradations of color, or a rainbow cake, using a different icing color to tint each layer. Bake a chocolate cake with different fillings separating the layers or mix different flavors into each layer for a taste sensation. Stack up a naked cake, one where the layering is the star because the exterior of the cake isn’t iced. Or, create a classic torte filled with whipped cream, mousse or fruit. 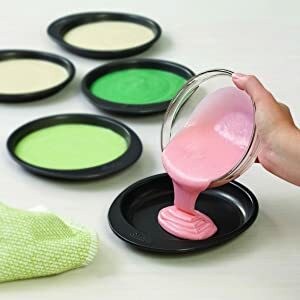 This cake pan set lets you play with your options! 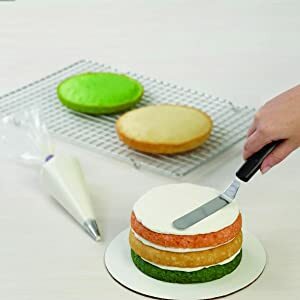 The pans in this innovative set are ¾ inch thick, the perfect depth for a multi-layered cake, and the non-stick pan coating means your cake will release and clean up with ease.